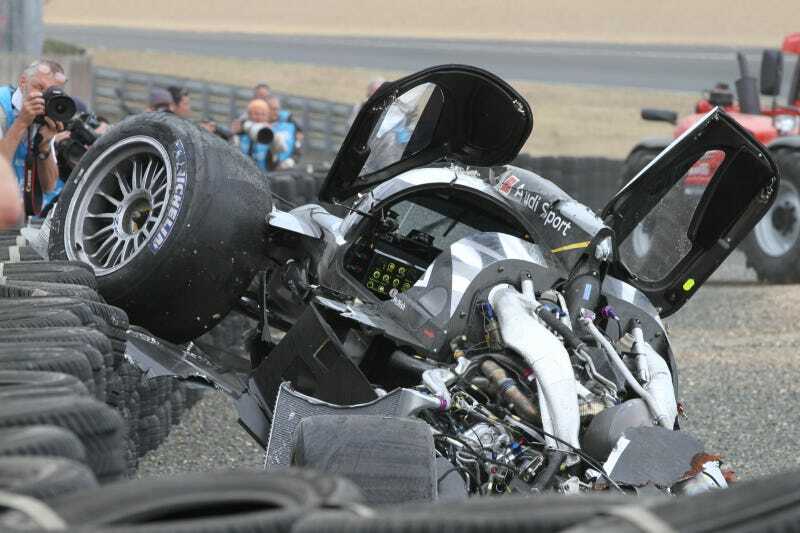 The first detailed accident photos of Allan McNish's R18 crash moments after it happened, showing what's left of the vehicle after it crashed into a Ferrari 458 and spun itself into the wall. The photos come courtesy of Quattroworld, Mike Juergens and Josh Decker, who had to duck to avoid the crash and will have the full gallery on the Quattroworld Facebook site soon. What this shows is the new Audi car did its job, keeping McNish alive and able to walk away from the accident. Credit also goes to the tire wall for keeping the car away from the spectators.